As search algorithms have continued to evolve, so have the strategies necessary to be effective in SEO. Too often marketers are concerned with title tags, links, and 301 redirects that they often forget that search optimisation starts with providing consumers content they want to see. Google has made it clear that if you want to increase you site rankings; you need to deliver relevant content to the user. The better you know your consumer, the better you can serve them content based upon their needs and ultimately drive them to purchase. This is where 'personas' can provide a huge advantage. Personas allow you to take existing, highly detailed consumer data from tools like Google Analytics, and better identify your users’ wants and needs. According to Bryan and Jeffery Eisenburg, personas are “modes of preferred behavior within the context of buying". In a nutshell, personas are what a consumer wants to know when making a purchase. An understanding of personas allows you to strategically craft a message that will resonate with your specific consumer. Based on the Myers-Briggs method, there are four different categories or types of personas that a consumer can fall into: Competitive, Spontaneous, Methodical and Humanistic. If you can identify which persona that consumer fits, you can provide them better tailor content and online tools. 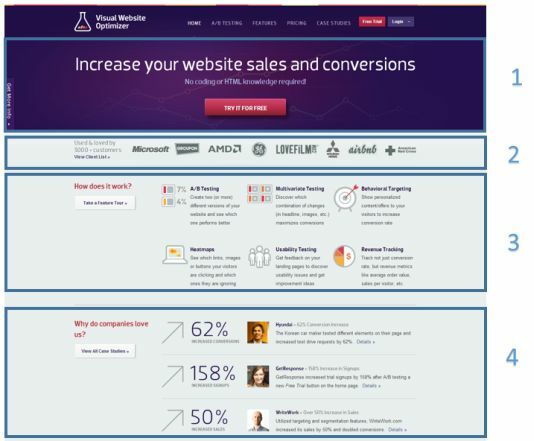 Here is an example of how a few websites customise their landing page to appeal to a specific persona. 1. VWO clearly states their value proposition and the benefits of their service - “No coding or HTML knowledge required”. Are you a credible company? 2. Here they reinforce their credibility by showcasing the thousands of companies they’ve worked with. How can you help me achieve my goal? 3. You can easily determine what tools the company offers and how they will enhance your productivity. 4. Once again VWO reinforces their credibility with testimonials and tangible statistics showcasing how their products have increased productivity for previous partners. 1. By explaining the benefits of the product on the landing page, they immediately ease all of the major concerns for their consumer. Can I customise your product or service? 2. Demonstrating the products actual use explains how their product will “enhance” the consumer’s life regardless of the situation. Can you help me narrow down my choices? 3. Showcasing different product options optimises the number of paths a user takes and makes it easier to locate information relevant to the user. How will this enable me enjoy life? 4. 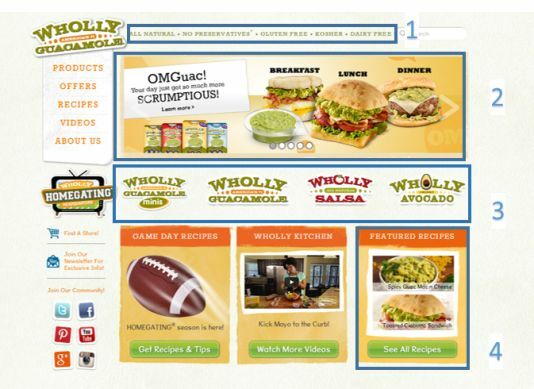 Wholly Guacamole provides over 100 different guacamole recipes to illustrate the different ways consumers can utilise Wholly Guacamole in dishes, dips and snacks. 1. The experience with Prime Lending is shown prominently on the landing page to ease the consumers concerns about purchase. 2. They clearly articulate what their company provides and the benefits of being their customer. ​What experience have others had with you? 3. Testimonials provide examples of Prime Lending’s customer service and builds credibility with the customer. What are the details/ fine print? 1. The warranty and product details can be easily found from the landing page without requiring the users to browse through multiple pages. 2. Dakin’s value proposition is found prominently on their landing page, reinforcing their commitment to quality and reminding the user that they are the largest manufacturer of HVAC products. 3. They provide an additional tools to help the user make an informed decision based upon their personal settings. Can you take me through this process step by step? 4. For individuals who are still unsure about the products and would still like additional help they allow you to locate a comfort pro dealer to assist you. When optimising your site for personas keep the user in mind and begin to address the user’s questions on your site. What can you provide for them? Why are you the best solution? Who have you provided solutions to? How you can provide a solution? All of these questions help you understand what messages you should be sending to your customers. Analyse your site today and determine what’s important to your audience and what isn’t. Making these few changes to your site will make dramatic difference on your customer’s web experience. Have something to say about this article? Comment above, share it with the author @juanbelljr or directly on Facebook, Twitter or our LinkedIn Group. Juan Bell Jr is a member of the Digital Account Planning Team at Sq1, an agency that takes data and turns it into insights, action and results, generating impressive ROI for their clients. He also has a passion for mobile technology, Dallas sports, and all things Microsoft.